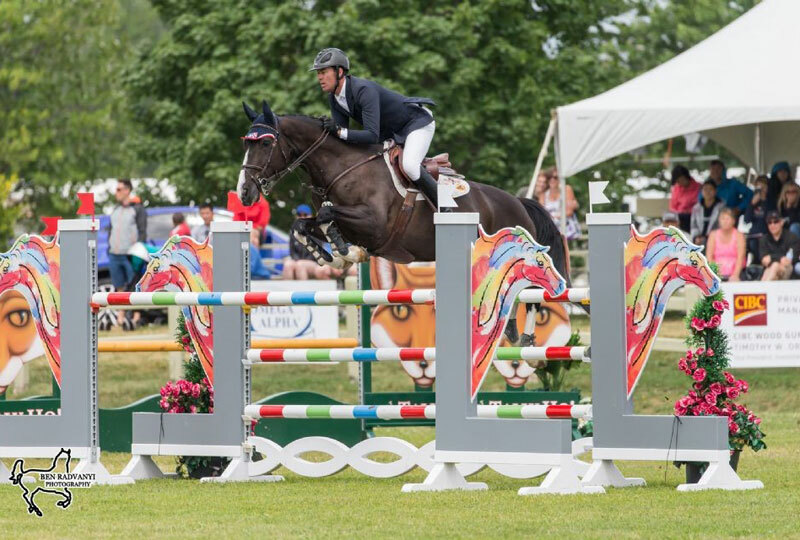 Jonathon Millar of Perth, ON, concluded the CSI3* Ottawa International Horse Show with a win in the $15,000 National Grand Prix, presented by CIBC Wood Gundy, on Sunday, July 22, at Wesley Clover Parks in Ottawa, ON. Twenty-eight entries contested the final event of the two-week Ottawa Equestrian Tournaments, with five horses advancing to jump-off over the course designed by Ireland’s Alan Wade. Sam Walker of Nobleton, ON, and Quivive SZ, the winners of Friday’s $10,000 Under 25 Grand Prix, were the second to return for the short course on Sunday, setting the score to beat at four faults in a time of 36.70 seconds. Millar and Camil du Parc du Menobu returned next, leaving all the rails intact in a time of 39.90 seconds to move into the lead. No other rider was able to jump double clear, securing the victory for Millar. Walker’s score held up for the second-place finish, while third went to Taylor St. Jacques of the United States, who incurred four faults in a jump-off time of 40.63 seconds riding Qantar des Etisses. Millar began riding Camil du Parc du Menobu two and a half months ago, after the 10-year-old Belgian Sport Horse, owned by Pascale Boulanger, was acquired from Quebec’s Francois Lamontagne. Millar is a regular competitor at Wesley Clover Parks and has attended the Ottawa Equestrian Tournaments since the event’s inception. This year, he and his family’s Millar Brooke Farm, based in nearby Perth, ON, brought a total of 28 horses to the Ottawa National and CSI3* Ottawa International Horse Shows. Prior to the start of the $15,000 National Grand Prix, competitors under the age of 21 took to the grass grand prix field for the CET Medal, with the win going to Sam Walker. The 16-year-old claimed victory with a score of 86 riding Houdini, an 11-year-old Belgian Warmblood owned by Patricia Raynes, while Catherine O’Connor, 15 of Peterborough, ON, finished runner-up with a score of 84 riding Melbourne Z. Walker and Houdini also topped the Jump Canada Medal class held on Saturday, July 21. The weekend’s highlights also included Saturday evening’s $5,000 Canadian Hunter Derby Series Open Hunter Derby, presented by Innisfree Equestrian, with the win going to Isabelle Lapierre and Carrera S. Lapierre, of Levis, QC, and the eight-year-old Holsteiner gelding topped a large starting field of 44 entries to take the win, while second went to Walker and Houdini, who proved to be equally talented in both hunter derby and equitation competition. For more information on the Ottawa Equestrian Tournaments, visit www.OttawaEquestrianTournaments.com. Find the latest updates, photos, and information by following Ottawa Equestrian Tournaments on Facebook here.